Visitors to Yellow Sands will be treated to beautiful river and seascapes. His name was Collins, and when we hadn’t pitched up at Site 20 (lovely sea view) that had been kindly set aside for us as we were arriving late — sites are not normally reserved at Yellow Sands — he came looking for us. Unbeknownst to him, when we’d got there earlier we’d found a truck with no driver parked on it, and with the sun setting fast, we’d opted to look for another. Ironically, we found out later that it was his truck, and he’d left it there to block the site for us while doing some chores in the area. 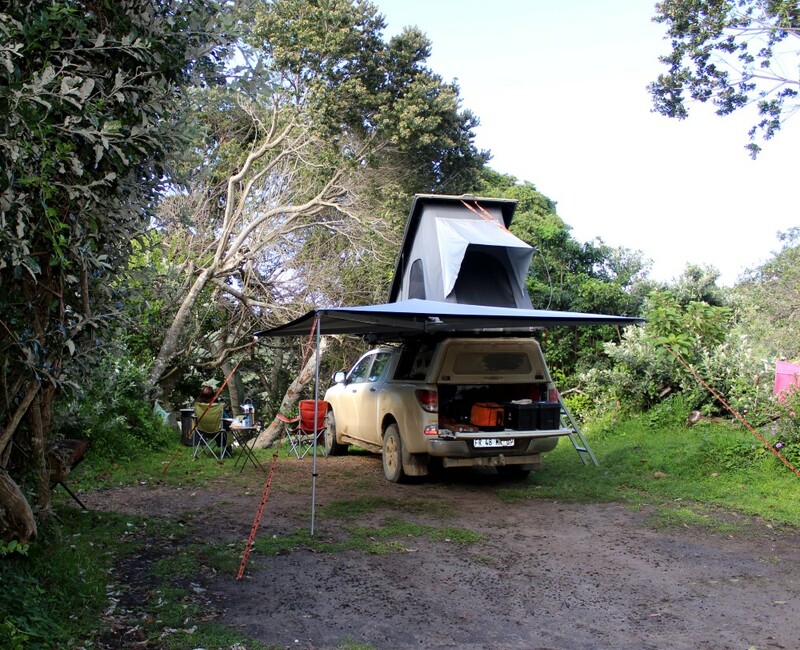 We could have gone back to claim it, but with camps set up and sundowners in hand, we were happy to stay where we were. Besides, we could see a section of the beach and Kwelera River mouth through a small gap in the foliage, we were screened off by hedgerows, and were directly opposite the ablutions. Perfect. 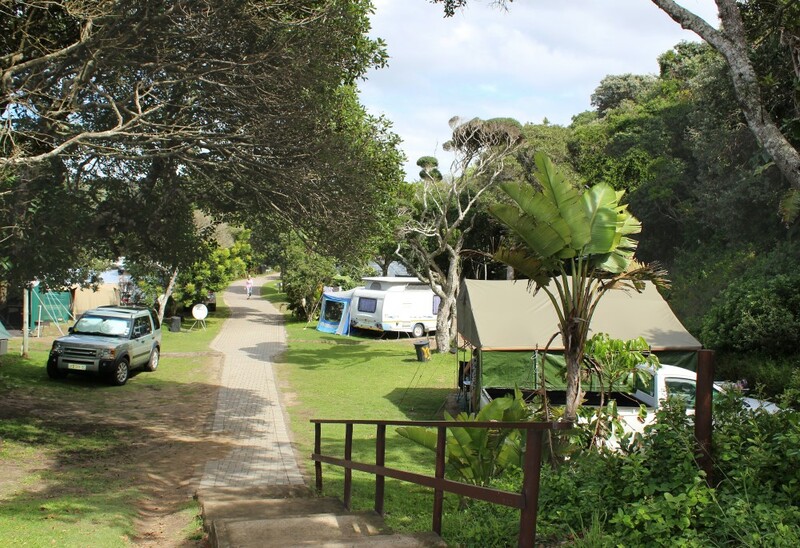 After taking a walk around this beautifully situated 20-hectare site the next morning, Annette and I were impressed by how well kept the place was; and were also fascinated by the mix of people this 55-year old caravan park attracts. 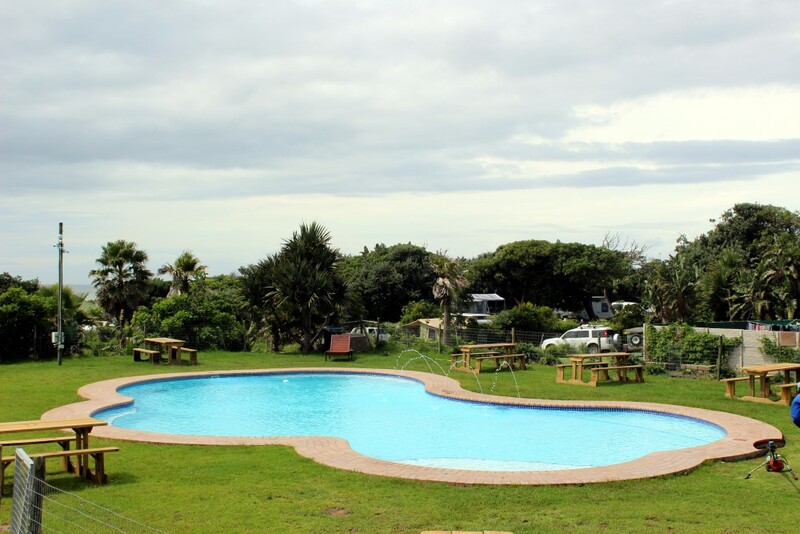 Originally a dairy farm, the property has been in the Leppan family for the past six decades and they have crafted it lovingly over time to provide clean, modern and functional facilities that serve the 190+ campsites now on offer. We were also fascinated to see just how well set-up some of the long-stay pensioners were, with their satellite dishes and solar charging systems. A few even had electrified low-slung fencing to keep their small dogs within their sites. 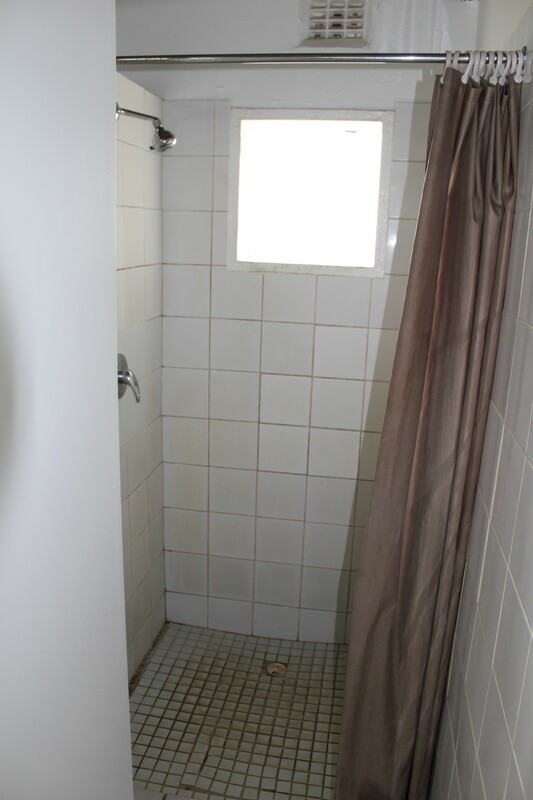 Being opposite one of the older (yet still perfectly functional and clean) ablution blocks, we were keen to see the upgraded B Block. We were also impressed by the clean lines and modern sanitary equipment and décor which had been incorporated there. 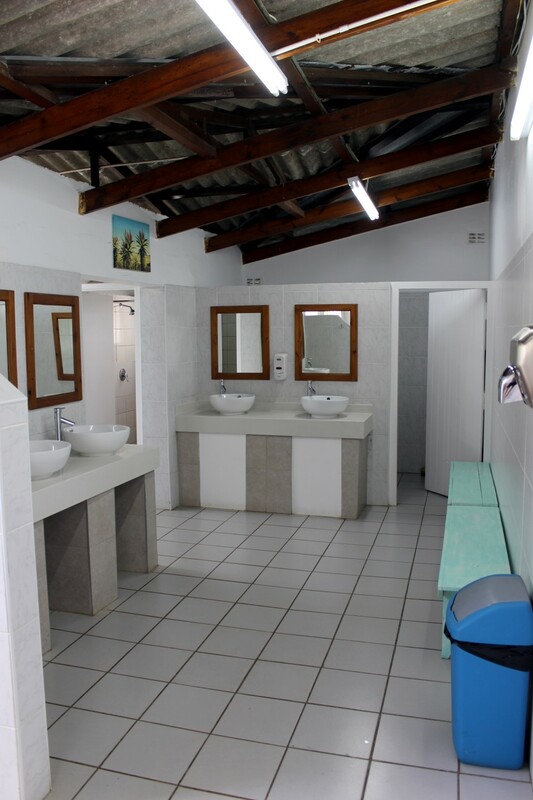 Yellow Sands has a total of three large ablution blocks (which are cleaned three times per day), each with male and female sections. 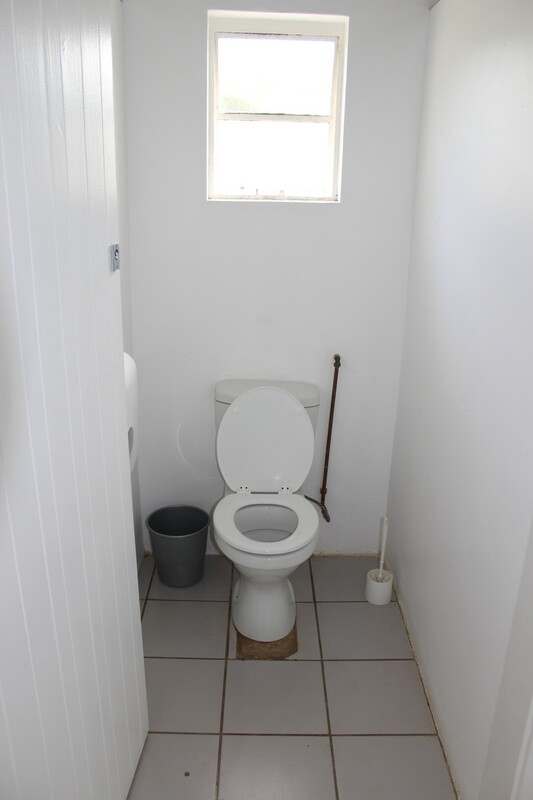 Most have 5 toilets, the women’s have 6, and the men’s sections have an additional 3 urinals. There are 6 showers, 1 bath, and 6 hand-basins. Pets: Allowed out of season, only small dogs (leashed). On our way down to A Block on the north-eastern side of the park, we took in the recently-added heated swimming pool − a large, sparkling-clean alternative for those who don’t want salt and sand in their swimsuits. Wandering further on, we located our ideal site and both made a mental note that this was where we wanted to be the next time we came here. 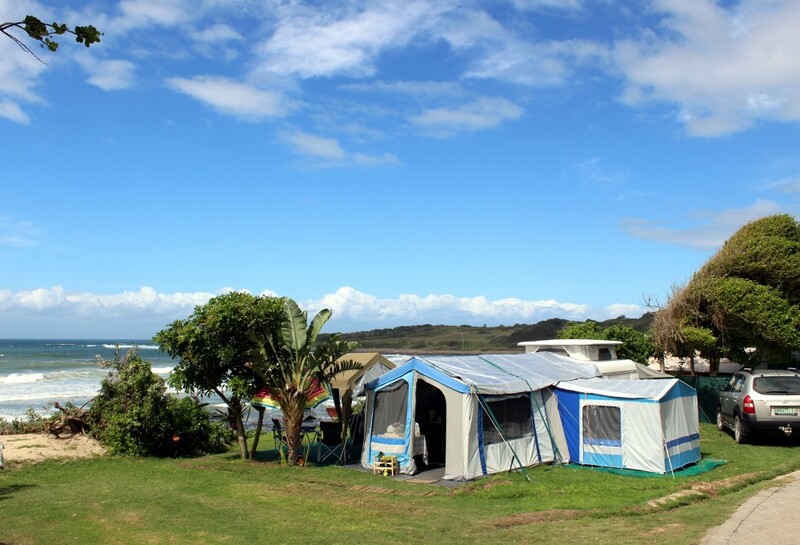 Located pretty much on the edge of the property, Site 53C had a hedgerow on one side, an old tree on the other, an uninterrupted view of the sea, and the advantage of direct beach access. However, the overriding reason for coming to Yellow Sands has to be its location. 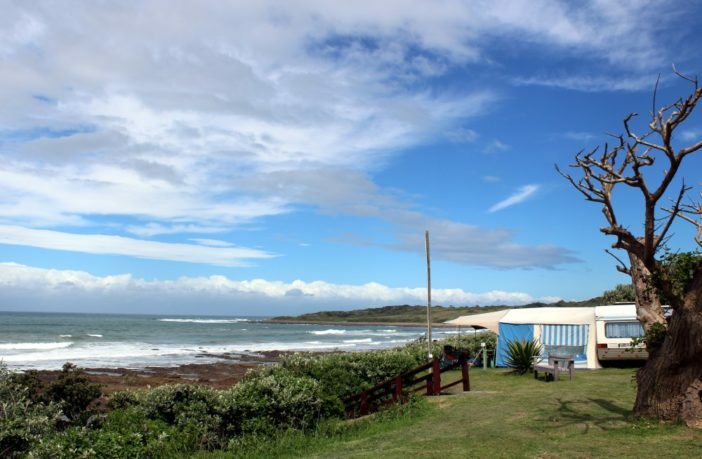 With beach and river fronting the entire site, and a nature reserve on the opposite side of the river, it surely has to be one of the best located caravan parks in the country. We decided to head back to our site along the beach. Ahead of us, a few toddlers were having a whale of a time. Watched by their mother, they rushed in and out of the water, and shrieked with laughter every time they got wet. As we got nearer to the river mouth, we saw fishermen casting into the estuary, and wondered enviously whether their catches would make it back to the braai fire that night. This reminded us that we had nothing to put on the half-drum braai Collins had kindly brought us the night before, so we headed for the small shop at reception. Unfortunately, braai meat was not on offer in the small convenience shop (it stocks only things like ice, wood, snacks and cool drinks), and although the receptionist kindly offered us some of her own supplies, we decided to whip up a simple Pasta Arrabiata instead. On our way out of the park the next day, we took a short detour to the River Camp. Although they were still making improvements when we were there, it’s the kind of rustic, away-from-it-all and naturally beautiful setting that appeals to wilderness campers like Annette and me. 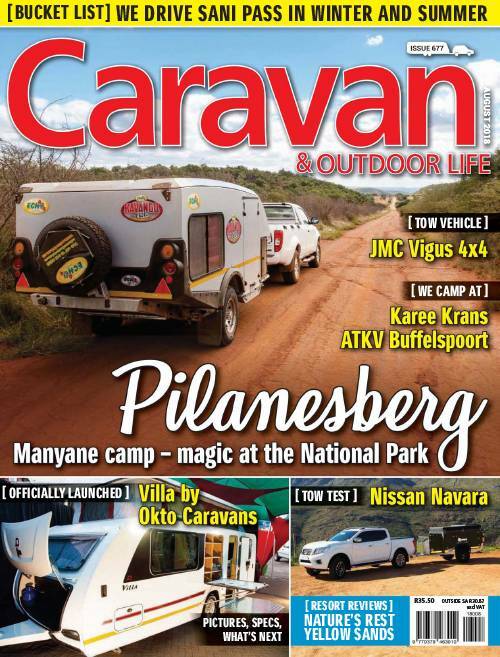 But, despite knowing that we’d be back one day soon, we now had a dilemma to solve: was it to be Site 53C or the River Camp? To find out more or to book, fill out the form below.